The word baby is spelled out with the letters I have die cut from pink textured card. They are set on each of the pink patterned squares. These are then framed with pink card that I have die cut cut with a scallop edge then all four are mounted on to a large silver square also die cut with a scallop edge. 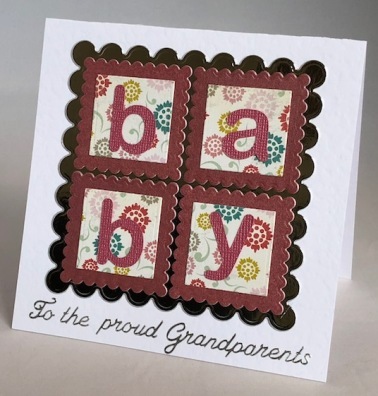 I have then added the wording To the proud grandparents in silver lettering. The card is blank inside for your own message of congratulations. If ordering by phone, please reference card #173.